Peptide DPKSAAQNSKPRLSFSTK(C), corresponding to residues 8-25 of human KCNK2 (Accession O95069). Intracellular, N-terminus. Homology Rat - identical; mouse - 17/18 amino acid residues identical. 1,2. Guinea pig Anti-KCNK2 (TREK-1) Antibody (#AGP-049), (1:800). 3,4. Guinea pig Anti-KCNK2 (TREK-1) Antibody, preincubated with the control peptide antigen. Immunohistochemical staining of perfusion-fixed frozen rat brain sections using Guinea pig Anti-KCNK2 (TREK-1) Antibody (#AGP-049), (1:400), followed by goat-anti-guinea pig-Cy3 antibody. TREK-1 staining (red) appears in neurons in the rat lateral substantia nigra (arrows). Nuclei are stained with DAPI (blue). Maingret, F. et al. (1999) J. Biol. Chem. 274, 26691. Lesage, F. et al. (2000) Am. J. Physiol. Renal Physiol. 279, F793. Kim, D. (2003) Trends. Pharmacol. Sci. 24, 648. Heurteaux, C. et al. (2006) Nat. Neurosci. 9, 1134. Woo, D.H. et al. (2012) Cell. 151, 25. KCNK2 (also named TWIK-Related K+ channel, TREK-1 or K2P2.1) is a member of the 2-pore (2P) domain K+ channels family that includes at least 16 members. These channels show little time- or voltage-dependence and are considered to be “leak” or “background” K+ channels, thereby generating background currents which help set the membrane resting potential and cell excitation. The K2P channels have a signature topology that includes four transmembrane domains and two pore domains with intracellular N- and C- termini. K2P channels are regulated by diverse physical and chemical stimuli including temperature, changes in intracellular pH, mechanical stretch, inhalation anesthetics, etc. The channels can then be subclassified based in their specific activators. KCNK2 can be integrated to a K2P subfamily that includes K2P4.1 (TRAAK) and K2P10.1 (TREK2) that are activated by intracellular unsaturated fatty acids such as arachidonic acid, lysophosphatidic acid and mechanical stretch. In addition, KCNK2 can also be activated by general anesthetics such as halothane and chloroform and intracellular acidification. KCNK2 expression in humans is largely restricted to the brain with some expression in ovary and small intestine while KCNK2 expression in rodents is more widespread. KCNK2 has an important role in mood regulation, as knockout mice show resistance to depression, suggesting that KCNK2 may be a potential target for anti-depressants. KCNK2 is involved in the fast release of glutamate from astrocytes. It requires the activation of Gαi, dissociation of Gβγ, followed by the opening of the glutamate permeable KCNK2 (TREK-1) K+ channel through its interaction with Gβγ. For this purpose, KCNK2 is localized at the cell surface of the cell body and processes of astrocytes. Immuno-colocalization of Kir3.2 and KCNK2 in rat substantia nigra.Immunohistochemical staining of immersion-fixed, free floating rat brain frozen sections using rabbit Anti-GIRK2 (Kir3.2) Antibody (#APC-006), (1:400) and Guinea pig Anti-KCNK2 (TREK-1) Antibody (#AGP-049), (1:120). 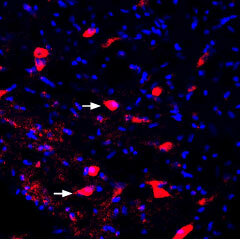 A. Kir3.2 staining (red) appears in cells of the substantia nigra pars compacta (SNC, arrows). B. KCNK2 (green) appears in both compacta (SNC) and reticulata (SNR) portions of the substantia nigra. C. Merge of the two images reveals co-localization in some cells (arrows), mainly in the SNC region. Cell nuclei are stained with DAPI (blue). Guinea pig Anti-KCNK2 (TREK-1) Antibody (#AGP-049) raised in guinea pig, is a highly specific antibody directed against an epitope of the human protein. The antibody can be used in western blot and immunohistochemistry applications. It has been designed to recognize TREK-1 from mouse, rat, and human samples. The antigen used to immunize guinea pigs is the same as Anti-KCNK2 (TREK-1) Antibody (#APC-047) raised in rabbit. Our line of guinea pig antibodies enables more flexibility with our products such as immuno-colocalization studies, immunoprecipitation, etc.